The average biker on campus understands the frustration of parking bikes during peak hours. Fortunately, Associated Students Bike Committee is always working to improve the campus. Currently, the committee is working on a new project to revamp the parking lots near the University Center and the west Music Building. This project was specifically chosen because of feedback from students. Depalma is not the only one who thinks this way. 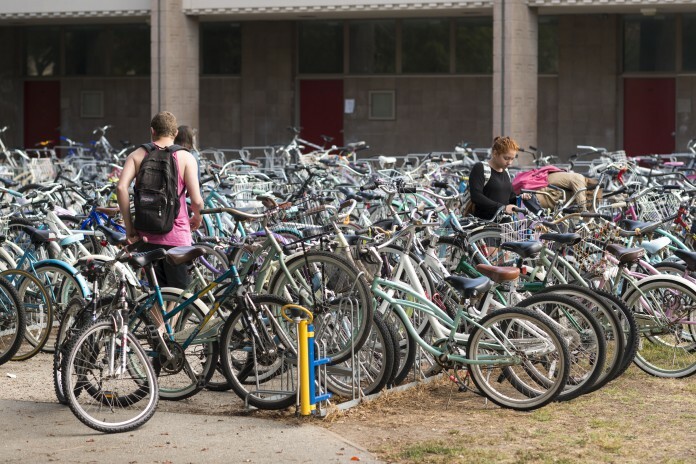 Many students have sent feedback to the Bike Committee, complaining about problems ranging from protruding tree stumps on the road to the dire need of new bike racks. “If it’s like the ones that I’m thinking of, it will be quicker because the bike racks at [the De La Guerra dining commons] you just put the tire up, and it’s faster. You don’t have to bend down and lock it from the bottom , so it would be faster, and so that that would be more convenient for people,” said Arianna Phillips, a first-year pre-biology major. After hearing all of these types of complaints from students, AS Bike Committee has developed some project ideas to ameliorate the situation. In fact, the Bike Committee does intend to replace the older bike racks with the newer versions, the peak bike racks, that can also be found outside of the DLG dining commons. These racks seem to be preferred by students and members of the Bike Committee. The committee is constantly watching the condition of the bike paths to repair them whenever necessary. In fact, they recently fixed the bike path on Ocean Road leading up north of Pardall. In addition to maintaining the bike paths, they also work on at least one large project every year. For the 2012-2013 year, they worked on the parking lot at Kerr Hall. During peak hours, the demand for the bike racks were too much for the 180 parking spots that were available at that time. Therefore, the committee worked on moving the racks to the North side of South Hall building to expand the bike racks. In the previous years before this, the committee fixed the library roundabout and the Storke Tower roundabout. “One of the great things about the committee is that our work is easily felt and very visible, as we are constantly working to improve the bicycle system through maintenance and repairs,” said Lee. AS Bike Committee hopes that the average biker on campus will feel the impact that the committee makes on the school campus.